Over five hundred people came to my Ark for Nature, in St Serf's church, many leaving messages in the visitors' book. I appreciate all those kind words. Every class from Comrie Primary School visited too, the children's interest in nature filling me with optimism for the future. They were a credit to their teachers and families. They knew about the importance of bees, insects, protecting the environment, taking care of nature. Class Five and Class One sent thank you letters, with their own drawings. 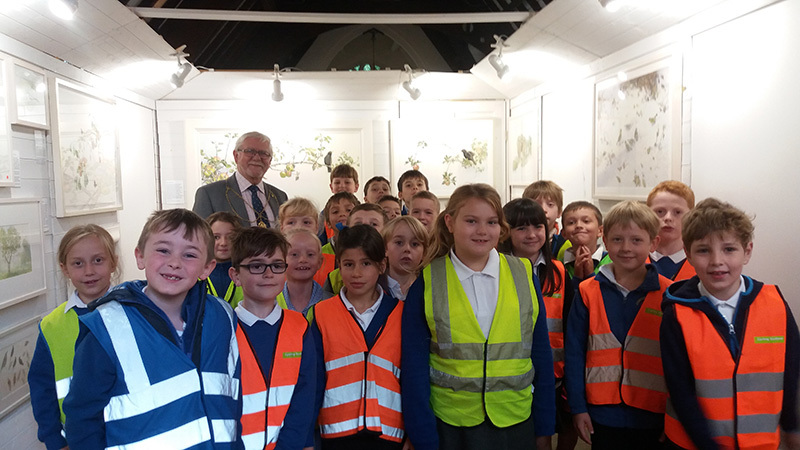 Thank you, too, to the Provost of Perth, Councillor Dennis Melloy, who visited alongside pupils from Primary Four class. We all enjoyed his visit a lot. He gamely joined in the questions over the cake-making machine. Sales were up, spirits were high. Thanks to all who organise Perthshire Open Studios and to the Vestry and Congregation of St Serf's for hosting my Ark. A selection of pictures from the exhibition are shown below: if you are interested in purchasing, please make contact.